Perfect Parties Tents & Events is a sister entity of Southside Rental Center, a general rental company providing quality equipment to the Bloomington Indiana area for over 30 years. Specializing in weddings, tenting, and special events, Perfect Parties Tents & Events has been established to better meet the more specific needs of our event customers. Serving all of southern Indiana, our experience includes; indoor and outdoor weddings, auctions, corporate and municipal gatherings, children’s parties and many unique special events. Be it a few items for a small family gathering or a complete rental package for a wedding of 500 or more expected guests, We are your Special Events rental source and more! In addition, Perfect Parties Tents & Events can help you find reliable vendors for catering, entertainment, flowers or even venue sites. We network with the area’s finest businesses to help you complete the planning process of your event. 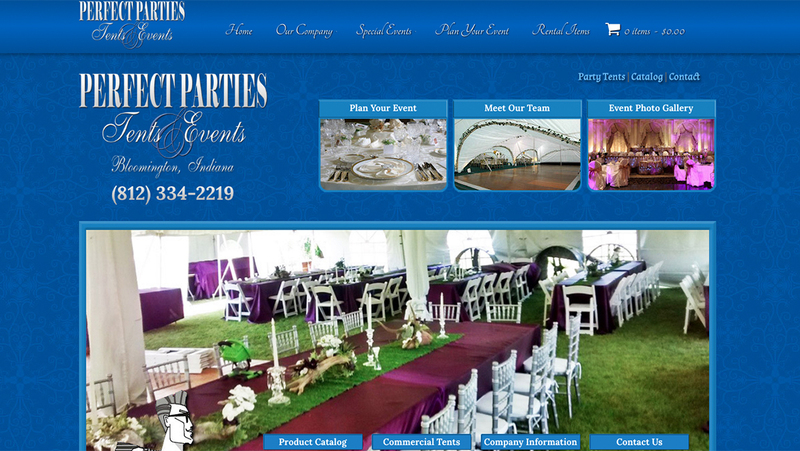 At Perfect Parties Tents & Events we know the value of exceptional customer service. Our knowledgeable staff of event consultants are ready and eager to provide ideas and suggestions to help you A+ your guests. You’ll find our delivery team to be clean, polite and neatly dressed in our trademark blue uniforms ready to deliver on time and set up at your request. It is our goal to surpass your expectations. For you next party start at the crossroads of special events, Perfect Parties Tents & Events, that is! We’re looking forward to making your next party a special event.